In the most basic sense, smart forms are dynamic. Instead of static words on a screen, smart forms can change based on how a user answers a question. Want to segment questions to different types of users? Perform complex calculations? Smart forms get the job done. Smart forms function according to if/then conditions, for instance, if a user is paying for a subscription, then they will be asked about their usage; if a user is not paying for a subscription, then they will be asked if they want to sign up for one. 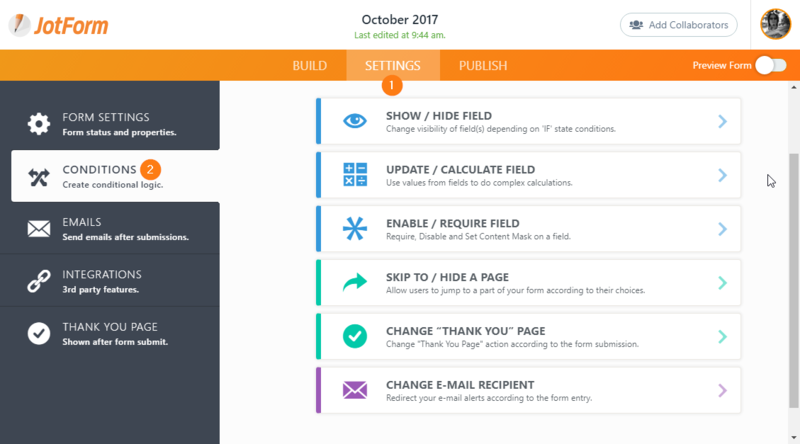 Sign up for JotForm so you can create smart forms. How do I set up conditions on my forms? Just follow the "Conditions Wizard" to smarten up your form. Click SETTINGS in the top menu, then CONDITIONS in the left menu. Select the condition you need. The Show/Hide field shows or hides a field when a specified condition is met. For example, if a user answers "Did you use our product?" with "Yes," then the form will show "How would you rate it?" If a user answers "Did you use our product?" with "No," then the form will hide "How would you rate it?" You can create conditional logic rules to perform calculations. Let's say you want to add values from two different fields and have the solution appear in a text box labeled "Total." You can specify the fields to be added and when they should be added. 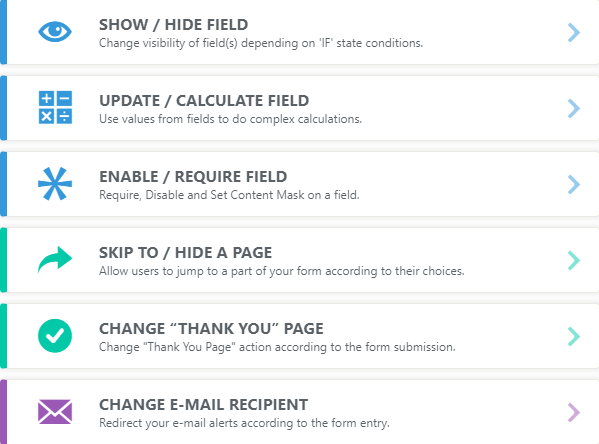 This option allows you to set a form field as REQUIRED or NOT REQUIRED depending on the user's input. You can also ENABLE or DISABLE form fields. This option can be used to conditionally set or change a field's Content Mask. The Content Mask helps users enter data by ensuring a predefined format, such an international phone number, will be followed. Allows you to skip or hide pages based on a user’s answers. You can ask additional questions on a new page or simply end the form. In this option, you can redirect to a different Thank-You page according to the form submission. Let’s say you list your white papers in a dropdown list and prompt the user to select one. After the form is submitted, the user will be redirected to the white paper they selected. You can also display a customized Thank-You page according to the form response. If your form is a quiz and the user’s responses for the quiz are not correct, it might be useful to provide the answers or additional resources on the next page. Send different email alerts based on your users’ responses. Let’s say you have a dropdown question with options like "Sales", "Support", etc. If a user selects "Sales," then a response will be sent to the sales department. This screen is a dynamic form. The fields you've added and the choices you have set determine the IF / THEN fields. 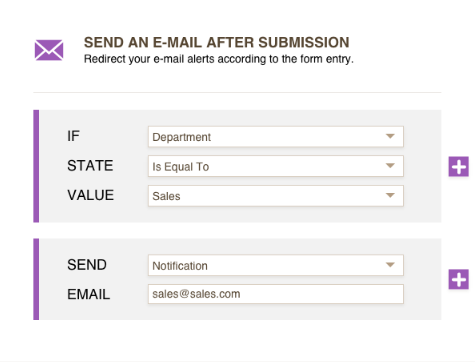 For example: If the department field is equal to sales, then the notification email goes to sales@sales.com. Once you complete a condition, save and test your form. Make sure that the condition is working properly before adding more conditions or your smart form will turn out to be not so smart. How'd you do? Did you have any difficulties understanding this guide? Please share your thoughts in the comments section below. Why did the condition logic is always disappear when I close the tab? how to do I run the payment wizard for payments without products, but using conditional logic to add up the cost? How can I set up a condition that requires the responder to make a selection from either Question 1 or Questions 2. I would like to require them to make a selection in only one of these two questions, but not both. Hi there, this is great! I have a form with a drop-down select question (Q1) that has about 60 options. I'd like the option that the person selects to set a value for another question (Q2) that has five options. (So all options in Q1 are mapped to one of five options in Q2.) What would be the easiest way to do this? Is there something easier than creating 60 separate conditionals? Thank you. I can email my form with condition. However I want to allow them to respond to the email by embedding this url which is a different form. and would like the option for them to just click on it to open. Our form has to go to multiple departments. I would like an automatic email to be send to the next department after the submission of each little section in our form. Is that possible? Really appreciate learning more about this jotform. Just figured it out! Sorry I am new to the software. Hi, I am trying to set up a simple show/hide field using If....is equal to....Then I hit a problem in the values box, as the value I want to select is not in the list! Even though it is showing on the build page? Help. What do I need to do to get it show in the drop down list? Is it possible based on their drop down selection I'd like the second page to generate a row of a google spreadsheet they can scroll through and review. Example: If the user selects "option 5" from the drop down on page 1, then on the second page a scroll box would show row 1 & 5 columns A-X, from a google sheet I have in my documents. Is there any way set up a conditional that is based on whether the form is filled out the 1st time or is filled out using the Edit Link? For example, when someone fills out the form the 1st time I want them taken to a special offer page. But if they are just submitting an update at a later time using the Edit Link I do NOT want them going to that offer page and want them redirected to another thank you page. Please advise. Thanks! Hi, it will not let me select the "IF" field I need to. There's only 1 option that becomes highlighted, out of 7 elements. Are there only specific form elements that have the ability to have conditions? Does this allow for conditional questions? For example, if you answer “Yes” on a question, then another set of questions pop up. não consegui instalar o formulário na minha fan page , o face book não aceitou alguém pode me ajudar ?? The employee would select a department and then the Division drop-down box would appear. So if some selected Administrative Services they would have the HR, Finance, IT to select from; if they select Police Department they would have Records, Investigations, Patrol to select from extra. I can't find the answer to my question among your FAQs. I created a JotForm (https://www.jotform.com/build/81617014808152) that contains several questions (12A - 12G) in which I want the user to be able to "Mark All That Apply". When I preview the form and click on "Fill Form" button, ALL of the options for these questions are checked and I cannot uncheck them. How do I fix this problem? A very helpful guide. Really useful as it helps in areas you wouldn.t necessarily think of using. Quero saber se a versao de logica é gratuita? When you select you status, it has to appear the right price connected to the payment system . I followed exactly you instructions but they probably work differently for the payment field. In one form you can only have 1 payment field, so I created three levels in prices field but how can I create the system to show the right price for the right member ? Is there a way you can make the form say hello to the person after they enter their name? Ex: if they enter John Smith, the form replies hello John Smith. How would I make all fields compulsory to be completed before users are able to submit the form? Hi, could you tell me if the user could receive copy of the form one time he finish to complete? I do not have Skip as an option condition. Why? -send email only when certain column is chosen in an input table. Hello, I want to send a notification email only when a certain column in an input table has a check. The table has two columns labelled "Satisf" and "Unsat". The example logics I've seen on this thread have a STATE of "is Equal to". I don't know what the functionality of the Contains state is in regards to the input table columns. As it stands right now simply putting the VALUE as the name of column of the input table, for which it sends the notification email when someone answers in that column, does not work. Problem: I'm not getting emails when I do test forms that have Unsat reponses. I HAVE TO MAKE A FORM FOR DIFFERENT PRODUCTS. THE PRODUCTS LIST WILL BE IN A DROPDOWN MENU. -when the user select the product, the list of another dropdown changes as per to the change in product. --My Problem is that how I will set the final price conditions because final price will depend on the selection of 5 to 6 dropdown's menu. I have set up the conditions and they are not working, at all :( I took screenshots and I am kind of at a loss here how to get them working. My form is basic "are you attending" form. Respondents can answer 'yes' or 'no'. I can stop after a number of submission but I would like to stop the form after X 'yes'. Is there a way to do so ? Like if I have W submission with the answer 'Yes' to the question 4 do not show question 4 anymore? I am trying to create a form in which by using "the spinner" clients can select the quantity of the product to purchase. After that lets say for example they chose 1, then they will have the option to customize that item by using radio buttons. My problem is that the quantity can go from 1 item to 200 items, so I would like to automate the process of creating a new radio button for every item they choose to buy. Please help me to find a viable solution without the tedious work of creating individual logic configurations to each quantity. Would it be better to have only a "yes" checkbox instead of yes/no? Hey blog post ! I was enlightened by the details , Does someone know if my business can acquire a sample IRS 4506-T form to use ? does not seem to be available was a 'state' option (although I am sure I was able to use it yesterday???? This is magic...it is so easy to use and does what i want exactly. Can you say IF: age bracket is 5-17 OR 18-25, THEN: charge $20? I just wanted to update my earlier problem. I was trying to use the conditional statements to update prices if a certain box was checked but couldn't figure out how to adjust it for all the different prices. Since last night I figured out that I had to make a statement for each price and it worked. Was a pain to write a statement for each one, hopefully it will work as intended.